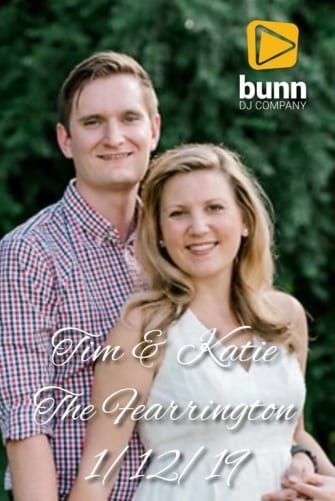 Katie and Tim had their ceremony at the Garden Terrace portion of Fearrington Village this past Saturday. I controlled mics for both officiants, the readers and four musicians. It was a lot of work, but I pulled it off! It was a great way to start a very cold and sleet-filled day! After the ceremony, the guests made their way to The Barn for the reception and cocktails (which were originally scheduled for outdoors). I had music playing as I did a quick strike on the ceremony gear and hustled back for introductions. The bridal party made their way in to “Wonderland” by Caravan Palace. Katie and Tim entered to “Booty Swing” by Parov. I had never heard either of these, but they were great for intros! As soon as Katie and Tim hit the dance floor, they went into their first dance by Josh Garrels. It was called “Heaven’s Knife”. I loved it. Katie’s father welcomed everyone, the blessing was said, and the food stations opened! After dinner, we had amazing toasts from the matron of honor and best man before Katie and her dad hit the dance floor to dance to “Daughter” by Sleeping at Last. Another great choice! Finally, it was time to dance. The floor opened with a song of their choosing (scary for me, but it worked). It was called “Lone Digger” by Caravan. Kinda funky, go check it out! We took a quick break in all of the dance for a cake cutting to “Attaboy” by Goat Rodeo Sessions and then a bouquet toss later in the night to “Dear Future Husband” by Meghan Trainor. At the very end of the night, the guests circled the couple with lit candles. Katie and Tim went around and blew out every single one. It’s a Hungarian tradition apparently (Tim’s family is from there). It was a perfect ending. After that, sparklers outside and they were off! I can’t wait to see the images from Krystal Kast.